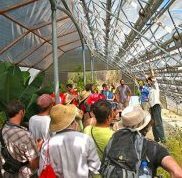 (7 August 2017) – The community in Tamera Holistic Peace Research centre in Portugal, which is committed to an autonomous, regenerative and decentralised energy supply, has published 12 guidelines for energy production in a culture of peace. The ecovillage already has a 20kW solar plant that supplies 60% of its electricity in summer and 40% in winter. Solar energy supplies 50% of hot water needs. It is now prioritising its plan to become a demonstration site for energy autonomy. Come Together – community is the basis for sustainability; this supports human communication and allows us to co-exist with nature in a healthy and equitable world which remains in contact with all living beings. Insist on using locally sourced energy – sun, earth, wind, water and biomass. Implement low-temperature and low-pressure technology for the production of energy. Cooking with solar mirrors and by transforming organic waste into biogas integrates humans into a healthy ecological cycle: it is therefore an integral part of an autonomous and holistic approach to food and energy production. Use self-regulating solar energy systems for cooling so that the simplicity of natural energy cycles are incorporated. Cultivate a new paradigm in machinery which mimics the functioning of natural systems as much as possible. For example replacing conventional combustion engines with mechanisms closer to nature such as breathing engines (e.g. Stirling engine). Integrate energy production into the design of human structures – this means promoting strong synergies between water, ecology, architecture and energy usage. Abandon the concept of global, centrally-controlled ‘one way’ circuits and move towards decentralized regional circuits that serve local communities. Create open systems which continuously feed energy surplus back into regional grids. Combine systems to eliminate the concept of energy waste – for example energy which heats the biogas digester is also used for thermal storage. Encourage autonomy by supporting local production and focusing on regional resources and communities. Search for continuous improvements through knowledge sharing, open source systems, and continuously returning to study and observation of nature. The Tamera technology team, who are working on the community’s energy autonomy plan say: ‘We will build systems for electricity, cooking and heating, and for solar cooling. We want to evaluate solutions for transport and install examples. We will include the research and development work of Tamera’s Solar Testfield and integrate the heart of our Testfield system, Jürgen Kleinwächter’s low-temperature Stirling engine,’ says its Technology Team in their latest newsletter. The team are organising a planning week from 2nd-9th September 2017. ‘If you are an engineer of renewable energy, or similar education, who has already built systems that use solar energy, and want to take part in the planning week or in this project’ please write to them. More details here.